What’s the best flavor of Bud Light Ritas? This is a trick question. Every flavor of Bud Light Rita is awful and wonderful. Often found in hulking 25-ounce cans near the back of your local corner store, these Four Loco clones pack a respectable eight percent alcohol by volume. It’s perhaps the best booze-to-dollar ratio you’ll find in an aluminum can. Don’t ever buy the malt liquor in a plastic bottle, even if you think it’s a better deal. That said, all of the Bud Light Ritas are technically malt liquor, but filled with sugar and refreshing flavor. Welcome to Gizmodo’s Happy Hour. Substance abuse for nerds. And there are so. Many. Flavors. They even vary by season, a bit of idiosyncratic marketing that lends an artisanal quality to the mass-produced drunk juice. 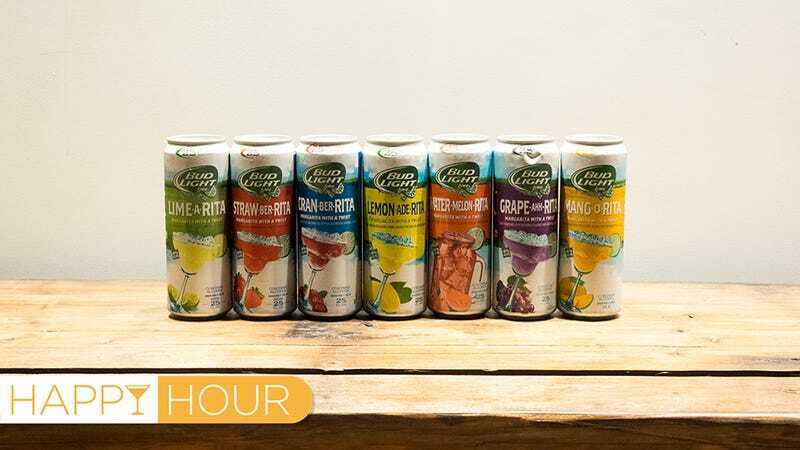 Here at Gizmodo, we like to help you sort the premium products from the swill, so we teamed up for a taste-testing and have ranked our favorite Bud Light Rita flavors. Cheers to summer! This one is only available in the fall, but we universally agree that it is the best. It’s basically carbonated apple juice that gets you wasted. This started out as a winter seasonal extension of the Rita line, but it’s so popular you can usually find it year-round now. Yet another seasonal special, the Lemon-Ade-Rita is like Mike’s Hard Lemonade in a can plus maybe an extra cup of sugar. This is the original Rita. As one reviewer on Beer Advocate describes it, the drink “smells just like a Margarita.” It tastes slightly worse than the worst margarita you’ve ever had. Do you like the idea of drinking Jolly Ranchers? You’ll love this flavor. A fruity treat, the Straw-Ber-Rita came out after the Lime-a-Rita. Imagine infusing a bunch of cheap vodka with strawberry-flavored Sour Patch Kids. And then add even more sugar. I can’t imagine that Bud Light made this flavor specifically to get teens into drinking. It’s alcoholic grape Fanta. Honestly, I don’t know how to describe this. I’ve never tasted parrot piss, but it probably tastes like a non-carbonated version of this. This flavor is so bad, we didn’t even bother testing it. Actually, we couldn’t find it, probably because it’s so bad that stores don’t want to carry it.